Tensions Roofs and Gables using a Bar through a pocket in the edge of the fabric. It is tensioned by Ratchet Straps or by Push Down Tensioner. The primary function of the plate is to attach the marquee to the ground and is also used as a pivot point to rotate A Frames into their vertical positions. They are also known as Foot Plates. Wire tensioning device using two-handed screw threads. PVC section, welded to roof with length of bungee used to secure the roof section onto the Eave Rail. Tensions roofs using elasticated bungee cord hooked to Eave Rail. Angled steel plate with a Ground Rail fixing pin, used at each corner to enable Gable Ground Rail attachment. Support rail for the top section of the PVC wall. Connecting pin with an over centre locking device. Loops of rope laced through eyelets in marquee fabric sections to attach them together. Lower edge of the marquee roof. Structural element joining Roof Beam and Leg. End wall of a marquee. Triangular top section of Gable wall that attaches to the Roof Beam along the Kader track. A tent set comprises enough fabric to cover two ends. Horizontal bar that secures the bottom edge of wall sections. Attachment system for fixing PVC to Aluminium extrusion using a PVC extrusion fitted within an Aluminium channel. Aluminium channel/track with slot to take Keder. Section used to extend Roof Beams, increasing a 12m marquee to 15m. An alternative to a scissor brace used when a window or door is required in a bracing bay. A longitudinal member in the roof of a structure used to stabilise the Roof Beam. Device used to lift Purlin sections overhead. Device fitted to Eave of marquee generating tension by screwing down onto Bar Tension Bar. Device used in Bar Tension System. Fixes between tension bar and hole in leg. 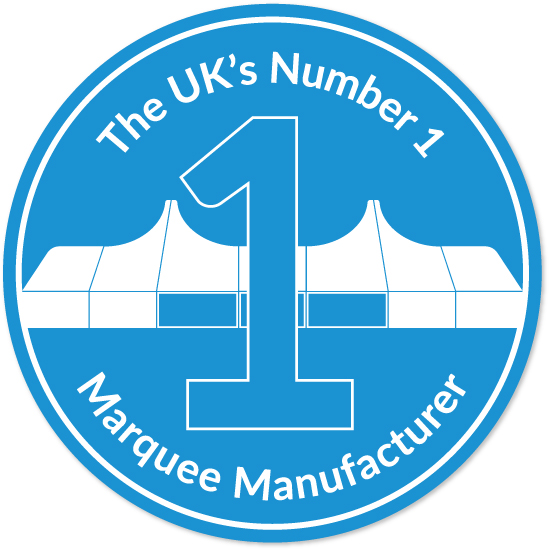 The line defining the longitudinal axis of the marquee roof. This line runs along the centre locations at the highest point on the marquee roof. Structural element joining two Roof Beams at the Ridge. Structural element supporting Ridge to which roof fabric is attached. Fixed length bar used as aid to setting out structure. A steel shaft driven into the ground as marquee anchoring device. Devise for removing stakes from ground. Section attached to Roof Beam to allow Purlins to be attached.